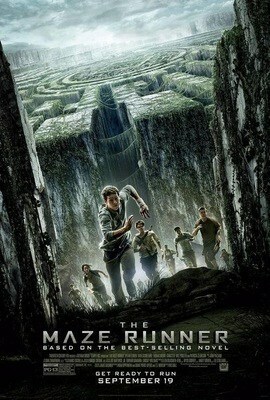 The Maze Runner film is based on the novel by James Dashner. What happens when 16 year old kids are dropped into the middle of an ever-changing labyrinth? The Maze Runner confused me. I mean, I could follow the plot okay, but I kept waiting for the payoff of “Why is this happening?”. It was a long wait. I’m still kind of fuzzy on whether I really understand what was going on. The Maze Runner is the latest dystopian young adult novel adaption to hit the big screen, following the success of The Hunger Games and Divergent. It’s a Lord of the Flies-esque tale of boys/young men stranded in an unescapable Glade, surrounded by the treacherous Maze of the title. They’ve built a society for themselves, complete with a strong hierarchy, rules, and punishments for breaking those rules. In my own mind, I am sure this is how young men would act if they were dumped together somewhere in a contrived situation. All-for-one and one-for-all. Into this microcosm steps (or rises) Thomas–they all arrive via a mysterious elevator that deposits one “greenie” each month, along with supplies they can’t produce themselves. He is confused, and so are we. All of the residents have had their memory of the past wiped clean–all they can remember are their own names. Some of the customs that evolved in the Glade were interesting, particularly the more ritualistic things they did to carve out their own society. The ways characters bonded to one another. But those moments were few and far between. Despite this being a movie and not a book, it still suffers from too much “tell” and not enough “show.” There are a lot of explanations with not enough justification or payoff. The characters are mostly one-dimensional, and we just don’t get to know enough of them. Followed by, we don’t really care about them. The environment was the most interesting part of the movie, but there isn’t nearly enough of the Maze shown. It’s enormous, completely surrounding the Glade, too tall to climb over, and in three years no one has escaped it. I wanted to see more. But I’ve always been fascinated by mazes . . .
Thomas (Dylan O’Brien) is far too perfect for me to find him compelling: he’s absolutely confident in everything he does despite barely having arrived in the Glade. He excels at everything, makes friends easily, is good looking, fast, nimble, helps others, etc.–where does he have to grow from here? Everyone else is just there in a supporting role. Alby (Aml Ameen), the leader of the Gladers, and Chuck (Blake Cooper), who arrived just prior to Thomas, are both pretty solid in their roles, but aren’t given much to work with. Gally (Will Poulter) and Minho (Ki Hong Lee) as part of the elite “Runners,” actually have some agency, putting a lot of depth into their performances. Teresa (Kaya Scodelario), the only girl in the Glade, and Newt (Thomas Brodie-Sangster), second-in-command, fall somewhere in the middle: they have things to do, but they just aren’t that interesting. 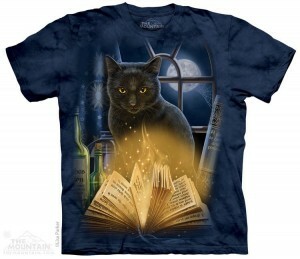 Overall, this one is for fans of the book only. Everyone else, enter the Maze at your own peril. The Maze Runner series follows kids dropped into an ever-changing labyrinth where they establish society while trying to escape the maze. Elektra Hammond emulates her multi-sided idol Buckaroo Banzai by going in several directions at once. Elektra lives in Delaware with her husband, Mike, and the cat herd of BlueBlaze/Benegesserit catteries. When not freelancing or appearing at science fiction conventions she travels world-wide judging cat shows.